It’s always exciting to see a new book from the Ottolenghi group, and this latest, devoted to sweet treats, is another winner. I received a review copy of Sweet: Desserts from London's Ottolenghi by Yotam Ottolenghi and Helen Goh. There are signature flavors you’d expect from an Ottolenghi book like rose water, saffron, and orange blossom water, and there are also classic combinations like rum-raisin, banana-caramel, and chocolate-peanut butter. The recipes span a range from simple to elaborate. There are cookies, cakes, cheesecakes, tarts and pies, desserts, and confectionery. I’m eagerly awaiting an upcoming occasion, or any sooner excuse, to make the Sticky Fig Pudding with Salted Caramel and Coconut Topping which would be perfect for Christmas dinner. The Saffron and Almond Ice Cream Sandwiches look like a lot of fun for a celebration too. There’s really not one thing in this book that I don’t want to try. A couple of recipes are intriguing because I’ve never tried making a rolled pavlova or a wide roulade that you stand on end and cut to see vertical stripes. Those are two adventures I look forward to attempting along with so many others. Custard Yo-Yo’s with Roasted Rhubard Icing, Cranberry Oat and White Chocolate Biscuits, Saffron Orange and Honey Madeleines, Banana Cakes with Rum Caramel, Coffee and Walnut Financiers, and Spiced Praline Meringues are all on my short-list. And, all the recipes come with straightforward information. If a specific pan is required, they let you know, and if there’s another size or shape that will work as a substitute, that info is provided. They also include good guidance on ingredients including the difference in texture between cream cheese sold in the US vs. that sold in the UK. 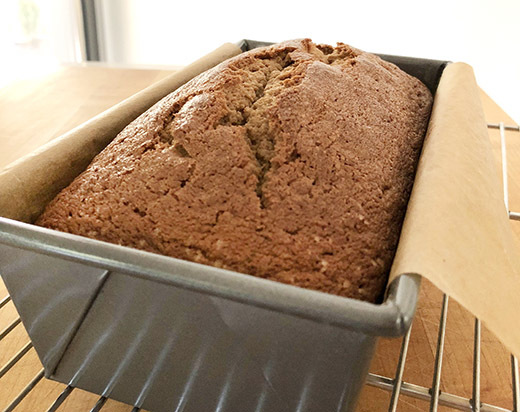 It wasn’t easy to pick a first recipe to try, but it’s fall and spice cake sounded perfect. 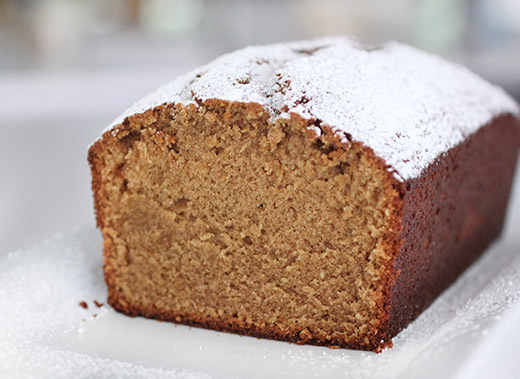 This is described as a simple spice cake, which it is, and as advertised the crumb is tender and lovely. The cake was originally made with Chinese five-spice, but mixed spice, pumpkin pie spice, or quatre epices are all suggested alternatives. It occurred to me that I’d never baked with quatre epices, and I quickly became fixated on it. Sadly, our neighborhood Penzeys is no more, and driving all the way across town to our local Savory Spice Shop seemed like too much. Instead, I gathered the individual spices that make quatre epices and made my own. I ground some whole white peppercorns, grated some nutmeg, and added ground ginger and allspice. I added a pinch of cloves as well. To start the batter, butter was creamed with dark and light brown sugar and orange zest. In a separate bowl, eggs, sour cream, and vanilla extract were whisked. In a third bowl, the spices, flour, and salt were sifted together. 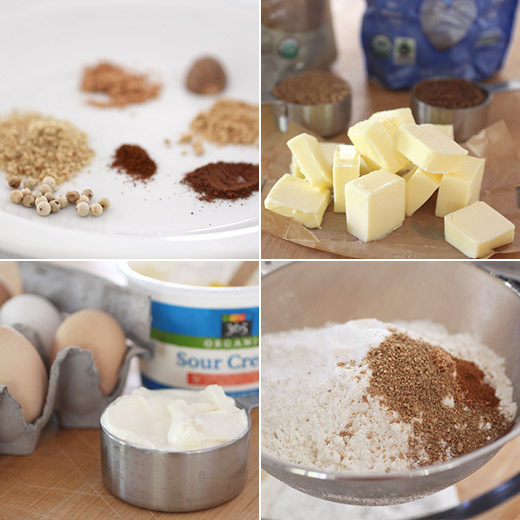 The wet and dry ingredients were added to the butter mixture alternately in thirds. Last, baking soda was mixed with apple cider vinegar, and that was added to the batter. The cake was baked in a small loaf pan for about 50 minutes. This cake belongs in a category of things you should bake to make your house smell wonderful. As promised in the head note for this recipe, there was enough going on here that no icing was needed. A quick dusting of confectioner’s sugar dressed it up nicely. For a sturdy pound cake, it did have a surprisingly light texture, and the spice mix was just right. Now, I’m faced with the challenge of deciding what to try next. The first thing I noticed about Cherry Bombe: The Cookbook was the variety among the recipes. When I started flipping through my review copy, it was immediately clear that there are a lot of different styles and cultural influences here, and I like that a lot about it. The recipes are all tried and true favorites from women who have been featured in or have inspired the makers of Cherry Bombe magazine. And, several of the recipes are family favorites rather than trendy dishes from the latest restaurant menus. The chapters are organized by Mains, Soups and Salads, Sides, Apps Snacks and Sips, Cookies Cakes and Pies, and Sweet Treats. I’ll be watching for the first local beets of fall so I can try the Pink Spaghetti with Beet and Ricotta Sauce by Elettra Wiedemann of Impatient Foodie. Jessico Koslow contributed the Lemongrass and Ginger-Brined Chicken that looks fantastic with a simple arugula salad. The “Million Ingredient” Autumn Salad from Naomi Starkman of Civil Eats includes delicata squash, persimmons, and pomegranate seeds and would be great on a Thanksgiving menu. Speaking of fall menus, the Pumpkin-Swirled Mashed Potatoes with Vegan Rosemary Gravy looks like a delicious way to celebrate the season. For a twist on a classic cocktail, Gail Simmons’ Charred Pineapple Margarita is on my to-try list. And, the Candied Grapefruit Pops, involving grapefruit segments skewered on sticks and dipped into caramelized sugar, looks like such a fun citrusy treat. 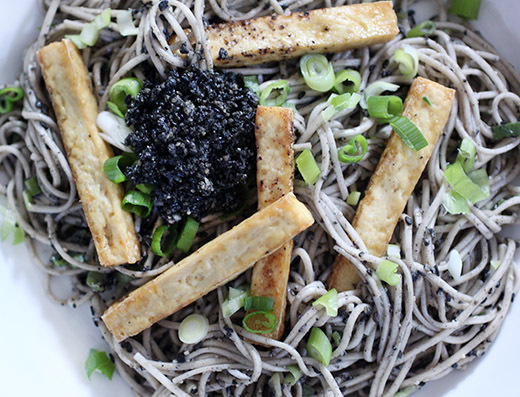 I started cooking from the book with the Black Sesame Otsu with Soba Noodles and Tofu from Heidi Swanson because the unique black sesame paste drew me in. That paste is sort of like pesto but taken in a different direction. Pine nuts and sunflower seeds were toasted in a dry pan on the stove. Black sesame seeds were added to toast briefly at the end. The nuts and seeds were crushed in a mini food processor, but a mortar and pestle would also work. Shoyu, mirin, sesame oil, rice vinegar, and some ground cayenne pepper were added. Drained tofu was to be cut into sticks and browned in olive oil in a skillet. My preferred method for browning tofu has for years been broiling. I toss the tofu pieces with oil, season them, and arrange them on a sheet pan. I place the sheet pan under the broiler, and every four minutes or so, I turn each piece of tofu so an uncooked side faces up until all sides are browned. The browned tofu was set aside while the soba noodles were boiled. Some of the water from boiling the noodles was used to thin some of the black sesame paste. A big spoonful of the sesame paste was set aside to use as garnish. The drained, rinsed, and drained again noodles were tossed with the thinned sesame paste and sliced green onions. The noodles were served with tofu pieces, more sliced green onions, and a dollop of the reserved sesame paste. I appreciated this recipe’s use of a couple of very Italian techniques that were reinterpreted with Asian flavors. The sesame paste paired nicely with the soba, and the notes in the book suggest several other uses as well such as serving it with spinach, roasted potatoes, or broccoli. I’d like to try all of those ideas. Or, I might revel in the variety by turning to a recipe found a couple of pages later which is a Caesar Brussels Salad. There’s a lot to explore here. Reprinted from Cherry Bombe: The Cookbook . Copyright © 2017 by Cherry Bombe, Inc. Photography by Alpha Smoot. Published by Clarkson Potter/Publishers, an imprint of Penguin Random House, LLC. This unique soba noodle salad is refreshing and distinctly Heidi. The writer-photographer-globetrotter-shopkeeper has a knack for creating meditative meals that touch on her travels and delight the taste buds in the subtlest way. Her inspiration here was a dish she discovered at a tiny restaurant in San Francisco, her home base. The umami-packed black sesame paste that flavors this salad can be made a few days in advance and also tastes great on spinach, roasted potatoes, broccoli, and other veggies. Toast the pine nuts and sunflower seeds in a large skillet over medium heat, shaking the pan regularly, until golden, about 3 minutes. Add the sesame seeds to the pan and toast for a minute or so. Remove from the heat as soon as you smell a hint of toasted sesame. Transfer the nuts and seeds to a mortar and crush with a pestle; the texture should be like black sand. (Alternatively, you can use a mini food processor.) Stir in the sugar, shoyu, mirin, sesame oil, vinegar, and cayenne. Taste and adjust the seasoning if needed. Set aside. Bring a large pot of water to a boil. Salt the water generously, add the soba, and cook according to the package instructions until tender. When done, reserve some of the cooking water and drain the noodles. Rinse the noodles under cold running water. While the noodles are cooking, drain the tofu, pat dry with a paper towel, and cut into matchstick-size slivers. Season the tofu with a pinch of salt and toss with a small amount of olive oil. Cook the tofu in a large skillet over medium-high heat, tossing every few minutes, until browned on all sides. 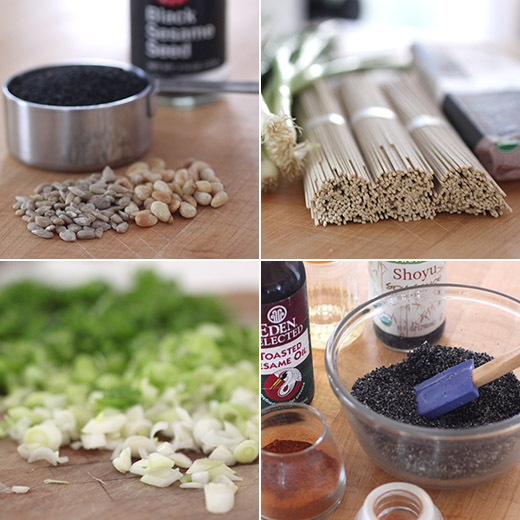 Reserve a heaping tablespoon of the sesame paste, then thin the rest with 1/3 cup of the reserved noodle cooking water. 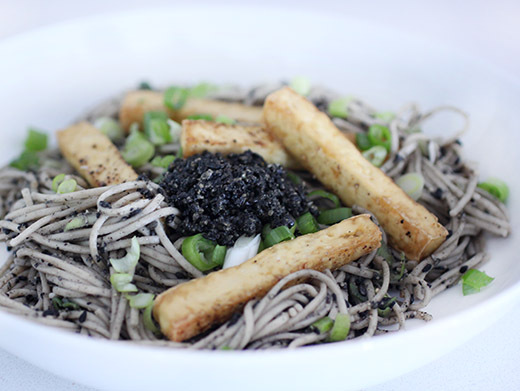 In a large bowl, toss the soba, half the scallions, and the sesame paste until well combined. Add the tofu and gently toss again. Serve topped with a dollop of the reserved sesame paste and the remaining scallions. I previously had baked from five of Alice Medrich’s books and always appreciate her insight into ingredients and precise instructions. However, I’d never used her first book until receiving a review copy of the newly republished Cocolat: Extraordinary Chocolate Desserts which first appeared in 1990. A lot has changed in the availability of varieties of chocolate and cocoa powder since then. These days, you can find exactly the cacao percentage you’d like to use for dark and even milk chocolate. But, back before such offerings could be found easily, Alice Medrich was creating incredible, artful desserts at her shop in Berkeley starting in 1976. In this new publication of the book, she has added some updated information including a Chocolate Chart. The chart indicates what percentage of cacao chocolate should be used for each recipe since when the ingredient lists were first written, they just called for semisweet or bittersweet. And, these are beautiful desserts. Any fear of attempting them will dissipate as you read the book. The instructions explain which recipes are deceptively simple and any of the more complicated steps for the truly show-stopping treats are carefully explained and illustrated. There’s a chapter full of torts that are all easier to make than you might first think, and they can be served simply or adorned. The Mocha Pecan Torte with a Mocha Glaze is one I want to try. Next is a chapter of Designer Desserts, and these require a little more time and attention for the incredible results. The Strawberry Carousel with White Chocolate Mousse and the Bittersweet Chocolate Truffle Tart are both elegant options for a special occasion. Not every recipe in the book is chocolate-focused. You’ll find a Coco Cabana cake made in a dome shape and topped with big pieces of coconut, Lemon Roulades that are made in petite individual serving size, and a Citrus Tart with glistening candied citrus slices. There’s also a chapter of Petite Rewards full of smaller treats like Walnut Squares which take brownies to a new level, Chocolate Dessert Cups that can be filled with ice cream or berries, and these dressed-up cookies shown here named for Sarah Bernhardt. So, who was Sarah Bernhardt? She was a French stage actress who performed around the turn of the 20th century. The cookies were invented in Denmark when she visited Copenhagen. 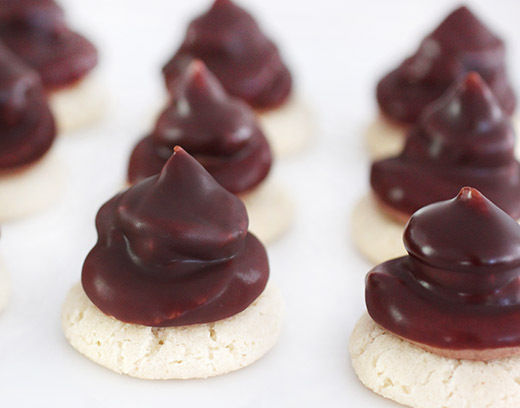 They’re made up of an almond macaroon base topped with a chocolate ganache, and the cookie is then dipped into chocolate glaze. In Cocolat, the photo shows perfect, little confections. The ganache has been piped into precise cone shapes, and only the top is covered in chocolate with the cookie base seen below. They are also adorned with flecks of gold leaf. Mine look a little more casual by comparison, but the flavors and textures were divine. They can be made in stages, but there are a few things to keep in mind. First to make the cookies bases, you do want to carefully measure the egg whites. It should be exactly three tablespoons and not just an eyeballed amount from one to two eggs as I did incorrectly the first time. My first attempt produced cookies that spread too much but were delicious thanks to the almond extract. The second time, I measured the egg whites and ended up with a thicker paste of a batter that was easily piped into small rounds. For the ganache topping, the recipe suggests making a double batch of the Chocolate Ganache in the book. That seemed like a lot of ganache to me, so I decided to just make a single batch and see how far it would go. I ended having more than enough to top all the cookies. The ganache is a simple mixture of warmed cream and chopped chocolate, stirred until melted and smooth, that was chilled overnight before being beaten to a silky, smooth texture. After lightening the ganache in a stand mixer with a paddle attachment, it was piped onto the cookies. I created more of a swirl shape rather than a cone. The cookies were then chilled while the chocolate glaze was made. The glaze was made from chopped chocolate, butter, and corn syrup. Once melted and mixed, the glaze needs to cool to about 90 degrees F before being used. And, it’s handy to place the glaze in a tall container to dip the cookies into it. 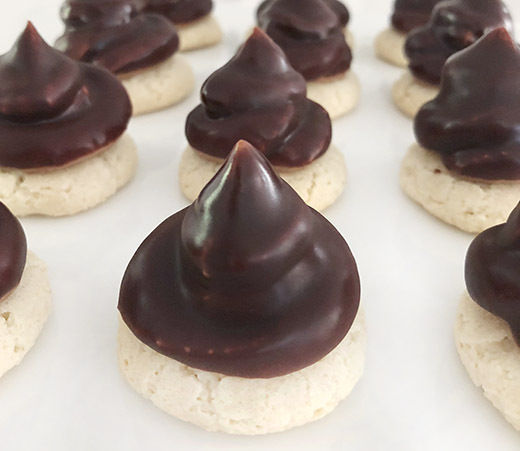 You could dip the entire top of the cookies or just the ganache, but work quickly so the ganache doesn’t become too soft. Then, chill the cookies again until ready to serve. 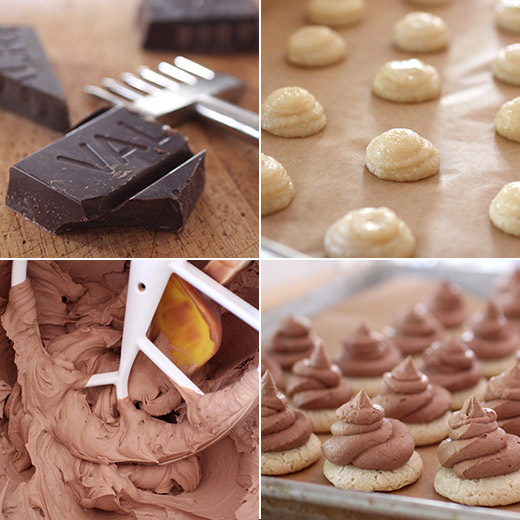 Alice Medrich is a master of chocolate confections, and I always love learning from her. The techniques in this book, from working with chocolate for glazes and piped decorations to ribbons of chocolate to top a cake, will set you on a path to making amazing desserts. And, as she points out, regardless of how the creations look, they’re going to taste delicious.